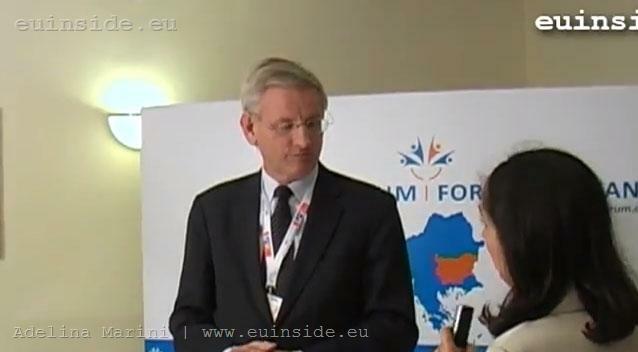 The Balkans are over with conflicts and the agenda of the region is already the normal European agenda - economic reforms, social progress and rule of law, Swedish Foreign Minister Carl Bildt told euinside during the Sofia Forum for the Balkans on 8 and 9 June 2012. He also added that among other things that the Balkans had to deal with the still unresolved problem of organised crime and corruption. In this sense, and having the precedent with the monitoring mechanism imposed on Bulgaria and Romania, Mr Bildt said that the European Union must be firmer in terms of implementation of the accession criteria with the next candidate countries. We need to ensure that commitments are really implemented, Carl Bildt said. He predicted that Greece would not exit the euro and in 10 years time the euro area would have more members than today. The EU is going to move toward greater economic and fiscal integration. However, this means more powers for Brussels and pooling not giving away national sovereignty, because "Brussels - it`s us", the Swedish top diplomat commented. Watch the full interview in the video file. We have used questions from other media as well. euinside:Let's first start with something that you said today in your panel and was that we are back to normality here in the region and that we have to look for another agenda but don't you think that the recent statements of the new president of Serbia kind of remind us that it's not over yet? euinside: Let's first start with something that you said today in your panel and was that we are back to normality here in the region and that we have to look for another agenda but don't you think that the recent statements of the new president of Serbia kind of remind us that it's not over yet? Carl Bildt: Well, history is always going to be controversial and that was clearly a statement that reflected that. But I don't think anyone here is in a danger of we going back to war and conflict. The agenda of the region is the normal European agenda - economic reforms, social progress, rule of the law. There is no longer changing borders and wars. euinside:And what should that agenda you're referring to be - economy? What else? Carl Bildt: I mean economy and social development have got to be key reforms for all these countries. We all face demands in that particular respect, if we have less problems or more problems. We have rapidly changing global economy, fundamental reshaping of the European economy and as long as we reshape and reform to be competitive, to be able to have the growth potential and to be able to sort of answer the social needs of our respective populations. Those have got to be the key issues. In addition to which you have in this part of Europe, I would add this thing which I said - the remaining issue of organised crime and corruption, which is still sort of the heavy legacy of those particular years. Question: Speaking of those reforms today Chancellor Merkel said that Europe should be moving towards federalism and Mr Barroso said that there should be a fiscal union starting soon. Then Hollande, the president of France, wants eurobonds, in which direction should Europe go really when there's new member states knocking on the door, when there's the financial crisis going on? Carl Bildt: It's obviously going to move in that direction whatever that means. I mean we've already done that - we've had a substantial strengthening of fiscal supervision, financial supervision already decided and it's now starting to happen. There will be further steps necessary along that particular road. Supervision of the banking system is clearly something that needs to be done on the European level far more effectively and far more intrusively than we've done so far. So steps in that direction will be taken. The fiscal compact does imply certain restrictions on how you can use your fiscal room for manoeuvre. That's already been in place. So it is moving in the direction of greater economic convergence and I think that it is going to be to the benefit of growth and social development in Europe. Question: What about the Western Balkans and the Balkans themselves, the members of the EU, do you think this new direction of the EU will alienate them more from the eurozone members? There's then in the recent past a kind of opposition going on between the eurozone members and the smaller poorer countries of the EU. Carl Bildt: Certainly hope not and I think that must be avoided. Sweden is not a member of the eurozone. We are very dependent on the euro. We have a huge stake in the success of the euro. We take part in a lot of the things that are necessary in order to stabilise it further but we are extremely keen on the integrity of the single market. The single market sort of unites the Bulgarian and the Swedish economies because that is really the strength of Europe and that must be preserved. euinside:The Croatian foreign minister conveyed a kind of message that the Balkans should embrace themselves and do things on their own. Do you think that we are ready to do that or maybe there are countries that are still not? Carl Bildt: I think overall you are. There is somewhat a different pace of reforms in the different countries but I think you can easily see things that you can do together - infrastructure, in terms of communications obviously - that's very obvious - I would add energy. Power and energy is gong to be an increasingly a problematic thing in this part of Europe and you have a lot of potential in order to develop those sorts of things but it needs to be done together. And organised crime and criminality is of course a cross border activity that also requires a form of cooperation across the borders. This is in the interest of all of the countries concerned. euinside:Having said organised crime and corruption, Bulgaria's prime minister showed that Bulgaria is a good example but it is a good example also because of the mechanism that it has, do you think that some countries or for some countries the accession criteria should be changed in order to address better these issues. Carl Bildt: Not necessarily change the criteria but be firmer on the implementation of things. The accession is very much geared to making certain that certain laws are in place, certain directives and those sorts of things. I think that what you will see and what will happen is that there will be an increased firmness in terms of really living up, implementing the different commitments. euinside:Therefore, would you approve the new approach of the European Commission to start negotiations from the problematic chapters, for example 23 and 24, with the problematic countries? Carl Bildt: Could be. Some of the problematic issues must clearly be there throughout the procedure in order to be absolutely certain that it's not just a question of one signing off to law something like that but that there is a proper record of implementation of the commitments. Question: Do you see Macedonia start negotiations this year with the EU and do you think the Hague tribunal decision should be respected because I saw that just Sweden somehow accepted this decision about the Greek veto? Carl Bildt: The ICJ has made a very clear statement on that particular. I think it should have implications on all of our countries. I mean it applied primarily to the question of NATO accession but you have to address it to the NATO countries. But this is clearly one of the issues that needs to be resolved and whether that will be possible to resolve this issue or not, I would hope that it would but it's not in my hands. Question: Right here in this forum, after the opening, our prime minister, Mr Borissov, told us that Bulgaria is against a name 'Northern Macedonia' because it would suggest a territorial claim. Have you been informed about this Sofia position in a bilateral dialogue between Skopje and Athens? Carl Bildt: No. Neither should we because this is an issue that needs to be sorted out between Skopje and Athens. From the sort of Stockholm perspective we want it to be sorted out but we won't have any views on exactly how it is sorted out. There's the ICJ decision. That's an important one. But that doesn't solve the name issue though. The name issue must be solved in a bilateral dialogue and then I assume that they take into consideration the views that might be in the rest of the region. But it's not for us northern Europeans to have views on it. Qestion: And what about the neighbouring countries? Should they interfere? Carl Bildt: I would assume that you have contacts with them the one way or another. As a matter of fact I'm quite certain that is the case. Question: You mentioned energy will be a huge problem for the region. Do you think shale gas could be a solution to that problem? We've had a lot of debate about shale gas. Carl Bildt: But is there a sort of potential here or? I don't know. ... on the ground that it might pollute the environment. Carl Bildt: Exploring doesn't pollute anything. Exploiting that's a somewhat different issue. I don't know exactly what is the potential here. What I do know in terms of the Balkans in general is the potential that is here for hydro power. This is a part of Europe with a lot of mountains and a lot of rivers and unexploited potential in hydro power. So that I think is an area where all of the countries should look at what can be done more. And I'm quite certain that quite a lot can be done more. And then is the case of integrating the grid networks and perhaps even make the region an exporter of truly renewable energy. Question: Do you think that the eurozone can survive a Greek exit politically and economically? Carl Bildt: I don't think there will be a Greek exit. Question: What if there is? Carl Bildt: That will have to be decided by the Greeks and if you look at all of the European polls in Greece they are distinctly against it. Add to that that if you look at what it would mean to exit, Greece has a lot of economic problems you might be aware of that, but to add to those problems with an exit from the euro would not be very wise. I don't think it will happen. Question: Do you think in the future with Croatia going to the EU and Macedonia eventually and then Serbia there should be precautions taken regarding accepting countries that are not quite ready yet to make it in as is the case with Greece maybe and then trying to fix this mess? 1976. They had three bankruptcies until now, they are used to it. Carl Bildt: But that was in old days. And with their own currency though. Carl Bildt: Well, you can go back even in the Ottoman times but that's a long time ago. At that time, if you remember, the European Commission was rather sceptic against Greece but then the decision was taken by the then European Community to let in Greece. I think that was the right decision because then was a question of bringing stability and democracy to southern Europe. We had the question of Spain, we had the question of Portugal. So the accession process there brought stability and democracy and that was right. But then of course one should have looked in subsequent years the politicians of Greece and the bankers and the bureaucrats in Brussels should have looked somewhat more carefully at the figures and I think that lessons have been learnt primarily by the Greeks themselves. euinside: You know, in the last days and weeks there are growing expectations that the June European Council would or should deliver very crucial decisions, a kind of a repeat of the October case. But given the divergences, are these expectations exaggerated, can we expect something really crucial to happen at that council? Carl Bildt: If you look at the different councils they always move forward. Not necessarily with gigantic steps but with steps and I think what you will see the European Council doing in June is to take further steps. But first look at the implementation of all the things that have already been decided, which is far more than most people are aware of. They are beginning to be put in place. Then I think there's obvious safe financial supervision that has some additional steps that need to be taken. And perhaps one would look in the process ending up in December. euinside: But it seems that markets don't wait? The pace, they find it too slow. Carl Bildt: Yes, but that relates to other issues. I don't think that these issues can be solved in one go. Europe is a work in progress and Europe is also, as you know, a coalition of at the moment 27 democracies. And democracies tackle decisions in democratic ways. But I think that as long as markets see that things are moving in the right direction that is the key thing. That we are getting a more coherent and more competitive, a clear perspective for the European financial and economic integration, I think it will be OK. Then you have on top of that, we have the specific problems of the specific countries and that has to be dealt with by the Greeks, by the Spaniards and by the Italians, by the Swedes. euinside: Would you agree with Ms Merkel's calls that more integration should mean giving more powers to Brussels, giving away sovereignty? Carl Bildt: In certain ways we are pooling sovereignty. I wouldn't call it giving away because Brussels is us but we are pooling sovereignty. We are exercising sovereignty together and in this case this is sovereignty of our own future. We can't do it on our own. it's simply not doable on a national basis. It's only by pooling sovereignty that we can have the powers to influence our own future. euinside: And last thing to bring you back to the Balkans. Do you see any risks that could stem from our region that could pose a kind of threat to the region or broader Europe? Carl Bildt: Not really. Not more than I could find anywhere else. Carl Bildt: Yes, because if you were to ask me that question on the Nordic countries I would say 'probably not' but you never know about the Danes. Jokingly. You can never exclude but I don't see, I said, the explosion ain't the problem, ain't it? That's not the danger. Stagnation could be a problem. And that has to be dealt with. euinside: Thank you so much. Question: I have a more global question about the Balkans. In the end of last century Richard Holbrook published his book "To End a War". Do you think that now, 12 years after the beginning of the new century, all the wars of the Balkans are stopped? I mean not only armed conflicts. Carl Bildt: Yes. History is a very long process but for our time yes. I don't see any reason for those sorts of things to reoccur. We can all go back, all started with the dissolution - I mean started started - but in modern times - with the dissolution of former Yugoslavia. And that brought up a lot of issues that had been left unsolved as a matter of fact. The last decade of the last century was dominated by the local wars very much the same way as the first decade of that particular century. But now I think as long as we have the European integration moving forward, as long as these countries are integrated I think we'll have stability. Question: Mr Bildt, last question, what did you tell Mr Gruevski a few days ago in Sweden? Carl Bildt: Nothing because I wasn't there. I was in Africa. Carl Bildt: Not in its current form, certainly not. Question: In what kind of form? Carl Bildt: In a better form. Question: Because right now many of its pillars, like Schengen and the eurozone, are under threats. Carl Bildt: Europe will not exist in its current form. It never does. I mean if you look at each 10-year period it changes, so of course there would be changes. There will be more economic and financial integration. I think in 5-10 years time the euro would be still a strong currency on the global markets. I think that it is likely to be more member countries of the euro that it is today. I think that it would still in 5 years time be countries struggling with some of the economic issues, the debt situation isn`t very difficult one in some of them in tax terms, we know from the Swedish experience, but overall. So, I am very optimistic. Some countries face vеry substantial difficulties now but if you compare with what we have done in the past, no reason why we cannot handle it.